Baking a homemade pie in your own kitchen doesn’t have to be complicated. 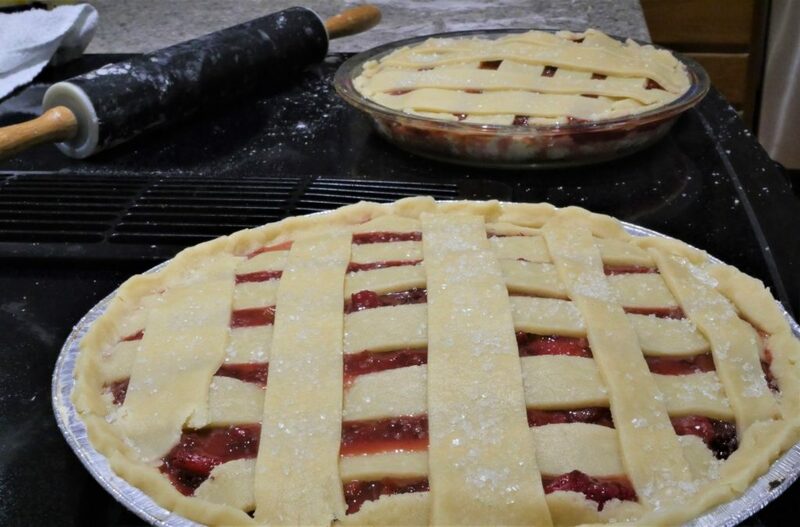 This fun recipe for rhubarb strawberry raspberry jam pie turns out great with minimal effort. Make your own crust or use a store bought – it’s completely up to you. Choose your favorite homemade or store-bought crust, depending on fast you want to eat pie. If you’re looking for a super easy pie, go ahead & buy a crust – I won’t judge you. Remember – you’ll need 2 crusts for this pie. A bottom crust & a top crust. Fruit pies are awesome because you can use almost any kind of fruit, and just adjust accordingly. 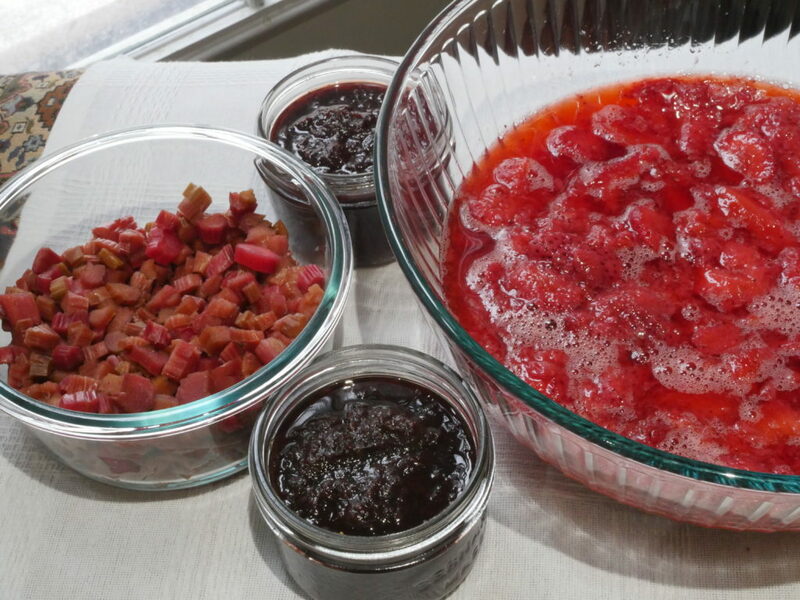 For the pie in the photo above, I used frozen organic rhubarb I harvested from my yard last fall, frozen sliced strawberries in sugar syrup (from the store), and a few jars of raspberry jam I made last season (also from organic raspberries from my yard). 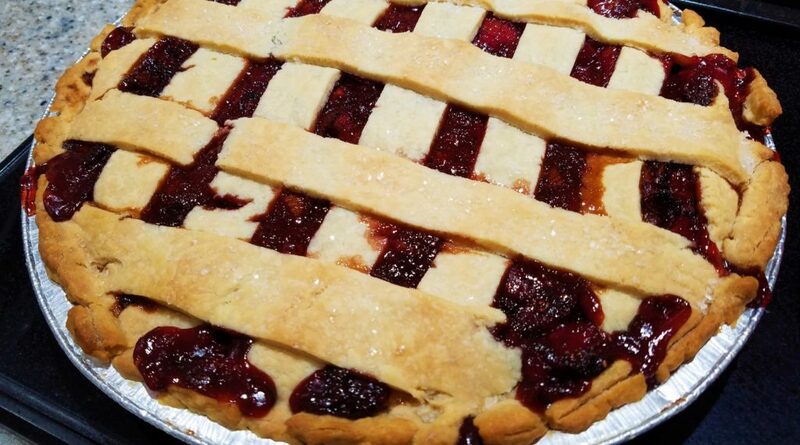 The reason I didn’t need to add any sugar to this pie recipe is because the sliced strawberries came pre-sugared & there was also sugar in the raspberry jam. 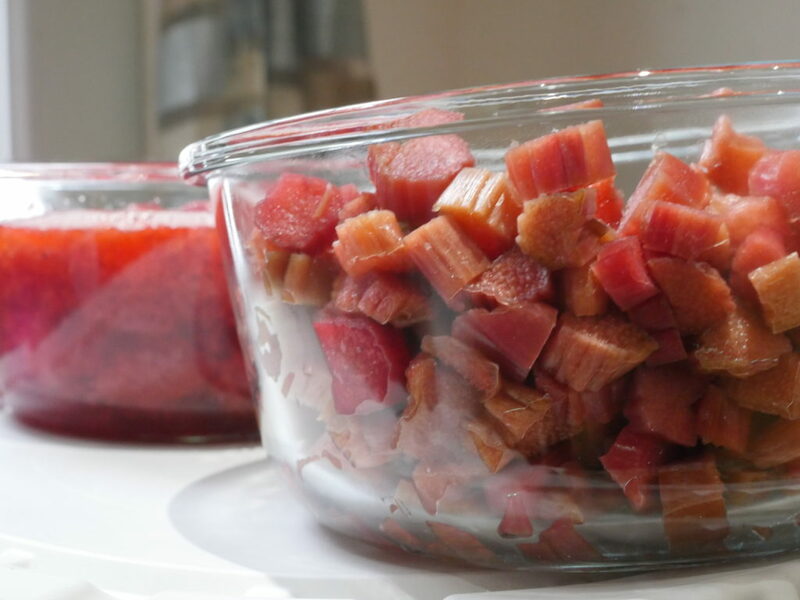 After mixing together the rhubarb, raspberry jam & sliced sugared strawberries (don’t drain! ), I tasted a spoonful of the raw ingredients, and it seemed plenty sweet. If you’re using a different combination of ingredients, keep in mind if your fruits are already fairly sweet or if you need to add more sugar to taste. Cornstarch is what thickens the fruit to the consistency of pie filling, once it’s baked. Cornstarch works its magic once it’s hot, simmering with the juices & sugars of the pie filling. Stir together your fruit & cornstarch, then dump it into the pie crust. With fruit pies that require a top crust, I like to get fancy with it & make a lattice, then top with large-grain clear sugar sprinkles. Creating a lattice is fun & not too complicated, as long as you have a rolling pin, a good flat counter top surface & extra flour. Some folks actually weave the perpendicular layers in & out of each other – I don’t. You’ll notice in the photo above, I lay all of strips running one direction first, then I lay all of the other direction down on top. It looks just as nice, but it’s less of a hassle. Bake at 400F for about an hour, or until the crust turns golden brown and you can see the filling is bubbling.